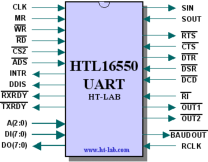 The HTL16550 is an industry standard functional compatible 16450/550 Universal Asychronous Receiver Transmitter (UART). Individual configurable FIFO depth for the transmitter and receiver can be set up to reduce the number of CPU interrupts. The UART includes a programmable baudrate generator capable of dividing the system clock by 2 up to 65535. The baudrate output signal has a 50% duty cycle for even values and a [(clk/2)+1 high, clk/2 low] for odd values. For System On Chip applications the baudrate output signal can be configure to a clock pulse period reducing resource requirements. Using a USB_to_TTL converter cable communications speeds in access of 1Mbps can be achieved. The table below shows a push button implementation of the standalone core for the 2 major FPGA vendors. The values given are an indication of the required area and performance. No pin number, slewrate, I/O type etc was specified. Xilinx ISE and Altera Quartus were used for synthesis and Place&Route. 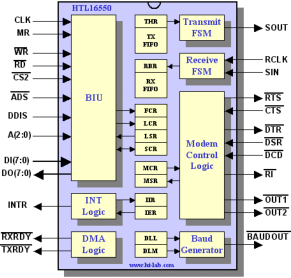 The HTL16550 is delivered in synthesizable vendor neutral VHDL source. 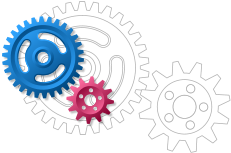 The source code is fully documented and can be synthesized using any modern synthesis tool. A partial self-checking VHDL testbench is included which verifies the different serial modes. For evaluation the HTL16550 can be supplied on a low-cost FPGA development board from Enterpoint Ltd. The HTL16550 is instantiated together with the HTL80186 processor, an HTL8259 Interrupt controller, an HTL8254 Programmable Timer, a 146818 compatible Real Time Clock, an HTL8255 Parallel Port Interface, a Watchdog timer and 40Kbyte of embedded SRAM. No VHDL source files will be supplied in this case.